The Climate Interactive team is heading to Paris for the UN climate talks taking place in the next two weeks. Drew Jones, Ellie Johnston, Travis Franck, and Beth Sawin from the Climate Interactive staff team will be there. Professors John Sterman of MIT Sloan and Juliette Rooney-Varga of UMass Lowell will also be joining us in Paris as well. If you’re in Paris, it would be great to connect! Details about our activities are listed below. We would especially love to see you at our World Climate COP21 Simulation event and our COP21 exhibit booth. If you’re not in Paris, join one of our webinars to follow updates. Live from the Paris COP21 climate talks, the Climate Interactive team will provide a general update on the negotiations and what’s happening around plans to reduce emissions in accordance with the INDCs. 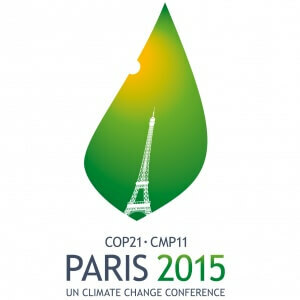 We will also discuss Climate Interactive’s analysis and work at COP21. COY Round table at the Conference of Youth – Responsibility of States and INDC: how are north-south lines being blurred? Description: Climate Interactive will offer a chance to explore potential pathways to address climate change through an interactive demonstration of the World Climate game and computer simulations C-ROADS and En-ROADS. Put yourself in the shoes of the climate negotiators to see what it will take. Analysis of the INDC pledges will be offered alongside a framework for understanding how climate solutions can and must address other challenges simultaneously. Giving participants tools that they can use themselves to evaluate climate pledges. Engage participants in a global network of people working with groups to educate others about climate action. Cultivate understanding of the pathways that still exist to meet our climate goals. Description: Stop by for a chance to explore potential pathways to address climate change through interactive demonstrations of the En-ROADS computer simulation. Description: Climate Interactive will be hosting a booth to showcase our work and facilitate networking opportunities. Come by to chat with us and try out our simulations. Beth Sawin is looking for Multisolvers – people who are able to implement solutions that protect the climate while improving health, equality, and well-being. Travis Franck is will be discussing Climate Interactive’s growing efforts to design simulation tools for African leaders. He is focusing on sharing our World Climate exercise and developing an agriculture simulation for African policymakers. He is also ready to discuss Climate Interactive’s community resilience simulations in the Horn of Africa and the DRC.